This year’s Tor de Geants, the 205 mile Italian mountain race was won by Frank Colle (ITA) and Silvia Ainhoa Trigueros Garrote (ESP). 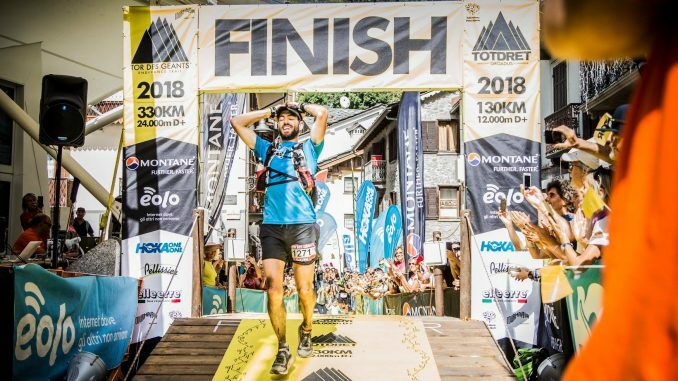 Starting and finishing in Courmayeur, Italy, competitors cover 205 miles (330 km) through the Itallian Alps, the Gran Paradiso Natural Park and the Aosta Valley with a cut-off time of 150 hours. At one point Colle had built a four hour cushion over second placed Canadian, Galen Reynolds but really struggled in the last 40 km. At the final checkpoint he was told that Reynolds was just a few minutes behind and he managed to hold on for the win that no doubt made up for the disappointment he felt being forced to retire after holding the lead in the 2017 event. Women’s winner Silvia Ainhoa Trigueros Garrote who led from start to finish took 10 hours off her second place finish time from 2017 to place 12th overall. Scilla Tonetti (ITA) and Jamie Aarons (GBR), arrived together at the finish line in Courmayeur eight hours later.